So as many of you already know, the Moksha Family Arts Festival starts this Tuesday and goes through Saturday, actually early into Sunday morning as I’ve been told! It’s going to be a lot of fun. I’ll be there, Alex Grey will be there, Manolo Torres will be there, and many other fine folks. We’ll be showing, at some point, some clips (or perhaps the whole movie) from Oliver Hockenhull’s new smash docu, Neurons to Nirvana, plus there will be readings, lectures, panel discussions, art exhibitions, performance art, concerts, and heaven only knows what else. So, in best southern drawl, y’all better come down there and see what’s join’ on, hear now? It’s amazing to have filmed one of the chapters of Dennis Mckenna’s’ Brotherhood of the Screaming Abyss” – Climbing the Vine, in which Dennis Mckenna shares the story of his ayahuasca trip in the Amazon with the Goddesses at the Temple of Tanith on Ibiza, Spain, with Schwann and Joey in 2004. In fact, this is the exact spot that the name for Cognition Factor was delivered to us through Joey and Dennis..or was it the Goddesses? If you happen to live in the Twin Cities area and are interested, I’ll be doing a book signing and reading at the Subtext Book Store at 165 Western Ave. N, St. Paul MN 55102 (651 493 3871) on May 14th. The event starts at 7 p.m. and will be a joint appearance with Sarah Fox, one of my former students and still a kindred spirit. She extended a kind invitation to join her to promote her new book of poetry, The First Flag, and I could hardly refuse, especially since I enjoy these events and don’t mind selling a few books either! Please join us for what promises to be an interesting evening. Ralph Metzner just posted an expanded review of the Brotherhood on his Blog page. In this review, an updated version of his previous review posted on the BOTSA listing on Amazon.com, he elaborates on that discussion and includes some excerpts from other parts of Terence’s work that are relevant to the ‘extraterrestrial mushroom’ hypothesis and other issues. He gives many of our ‘crazy ideas’ thoughtful consideration and suggests that they might not have been so crazy after all. His essay is worth your thoughtful consideration! Greetings and Happy 2013 from the edge of the Abyss! Or perhaps I should say from the storage locker at the end of time, because sometimes it seems that I am caught in a time loop, and will never manage to finish the task of sending out the printed editions to my loyal and (hopefully still patient) supporters. But there has been and is progress, and the first day of the first post-singularity year seems like an appropriate time to post an update. Presumably we all got through the singularity, or if not, whatever has replaced the previous reality looks like a pretty close facsimile; and so, we continue. Here I wanted to give you a brief synopsis of the status of the fulfillment project, and of my schedule over the month of January. Expanding Mind — The Screaming Abyss — is my recent interview with author and cultural commentator Erik Davis on his weekly radio podcast on the Progressive Radio Network. The second is from December 2010, my first appearance at the National Arts Club in New York. They must have liked this talk because I have been invited back, and will be speaking there again on January 4th. Hello, and best wishes of the season to everyone. Anyway, all that said I wanted to post a very important update about some logistical matters that (we hope) you will not ignore. Or, ignore at your peril. Now that the BOOK and EBOOKS actually exist in this dimension, I wanted to give interested people some current information about where to BUY THE BOOK, upcoming EVENTS, and a few LINKS of interest. Website: http://www.Brotherhoodofthescreamingabyss.com is up and running, and gradually with the help of my ‘web angel’ David Gaian (much more than a guru, and more useful too!) we’re working to increase its functionality and usefulness. The Brotherhood Ebook is launched! 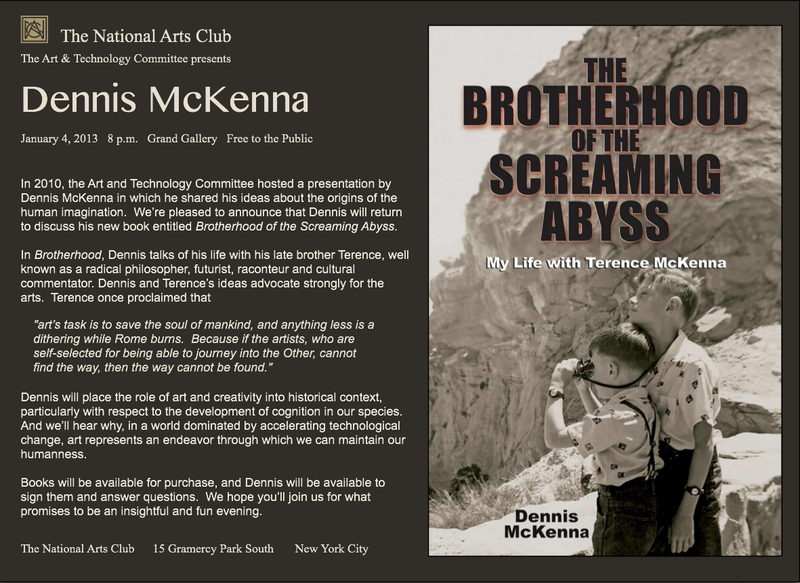 I’m pleased to announce that the Brotherhood of the Screaming Abyss Ebook is now launched on Amazon (Kindle version) and Barnes and Nobel (Nook version) web sites! This process is not instantaneous (they don’t tell you this until you hit the button), it will take 48-72 hours before the books can be seen and purchased on the sites. Keep an eye on this site; I will post an update as soon as the books are available for purchase. Again, my sincere thanks to all my supporters and all those with an interest in this project. It could not have happened without your help. Please now go tell your friends about it and let’s sell some books! And, a special remembrance to my brother Terence. Today is his 66th birthday. I love you Terry. I wish you were here, but somehow, I know you are.